In 1896, pharmacist James P. Whitters set out to formulate a soothing nasal wash designed to deliver benefits beyond what standard saline solutions could provide without including the high levels of alcohol found in other products of the time. The result was ALKALOL, a refreshingly strong saline wash that contains a select blend of natural extracts and aromatic oils to help dissolve mucus, clean and moisturize the nasal passages, and provide invigorating relief from the symptoms of allergies and colds. The Alkalol Company was incorporated in Massachusetts in 1907. Alkalol soon became available throughout the United States and abroad, quickly gaining popularity with people searching for a more natural way to treat the symptoms of seasonal allergies, sinusitis, colds, and chronic congestion. 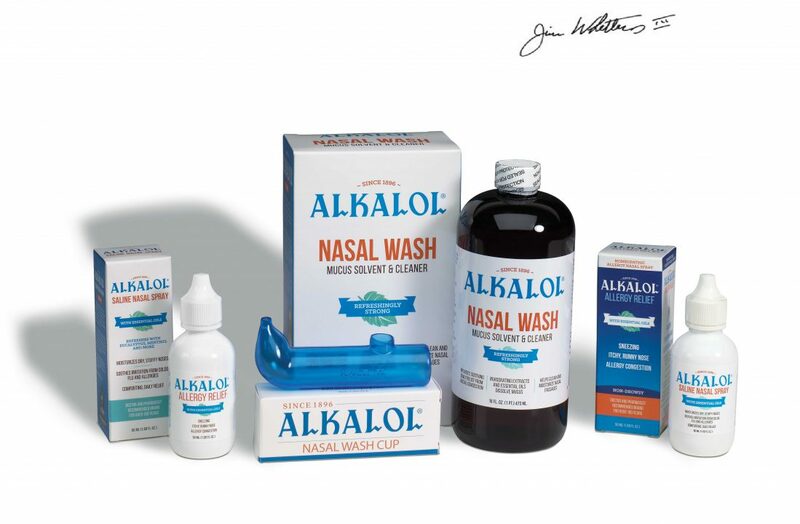 Our product line has expanded and now includes our original Alkalol Nasal Wash, Alkalol Saline Nasal Spray, and homeopathic Alkalol Allergy Relief nasal spray, providing three unique solutions for sinus health relief. Four generations of the Whitters family have been involved with The Alkalol Company. We remain family owned and operated and based in Massachusetts. Like my great grandfather, we are proud to stand behind the unique sinus health products we have been providing since 1896.